This is what the new Scissor Sisters is doing: I was sitting in my room listening to it and, after the fifth song, start thinking how wrong it is for me to be listening to it like this— hanging out with the cat, lamenting the insularly rural town I’m stuck in while eating baker’s chocolate. I really should have been listening to Lisa Loeb, but she’s just too much for me right now; every time I listened to her over the spring, it completely ruined my day. 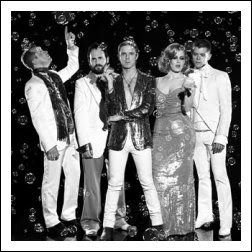 But some of the earlier lines from “Harder You Get” provide a really concise thesis for the new Scissors’ LP— Jake Shears’ growling about being on a first-name basis with the reaper tells us “It isn’t Stephen / It isn’t Adam,” and continues into offering “I got some apples / If you want / Then you can grab ‘em” and this is such a wonderful economy of words! T.S. Eliot? We have no time for you. But the thing about it is this is a really tough song. It’s like the tough one of the LCD Soundsystems was talking about in their interview with some pasted-together, hand-written fanzine (Rolling Stone) where he was giving his taxonomy inre: certain adjective’s relationship to music. “Tough? That’s the gayest disco sound in the world— a sound that’s so gay and over the top, it’s tough.” Think of the bears on Christopher Street listening to “Walk on the Wild Side,” from when it was still the new single; there might even be a latent homage with all of the “do-do-do’s” later on. This is a really fierce, tough, and intimidating record. It’s sweaty and furry and leathery. Maybe this is what Gaga really wants to be doing? She should really get off of Interscope, what do you think about that? I feel like I’m letting this record down by listening to it here. I feel like it’s really asking for lots of hips. Maybe it doesn’t care that much about what they’re doing, but it just wants them to be there; nonetheless, even if I’m kind of bumming it out— and I’m really sorry about that, Night Work, you deserve better— it’s having me look at where I am right now and telling me the world is a fruit even the most prudish of snakes are insisting I take. And that fabulous day can not come soon enough, especially as an icky double entendre.